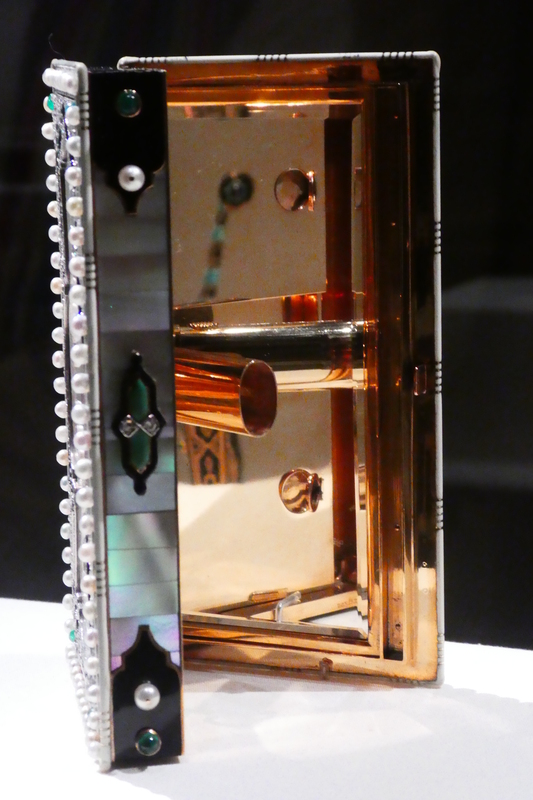 These are just a few of the pieces in the exhibition. 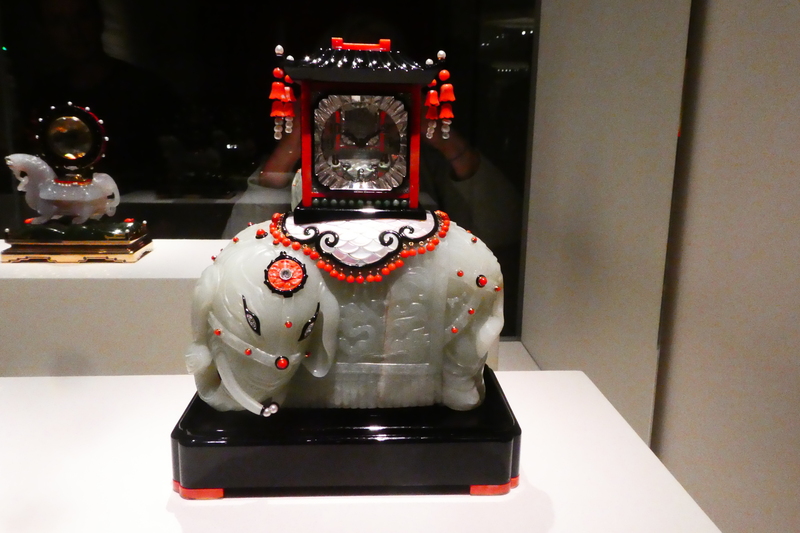 The photos are not wonderful, because of the glass cases they were in and also because diamonds do sparkle enough to mess up a photo. This is the one that greeted me as I entered. 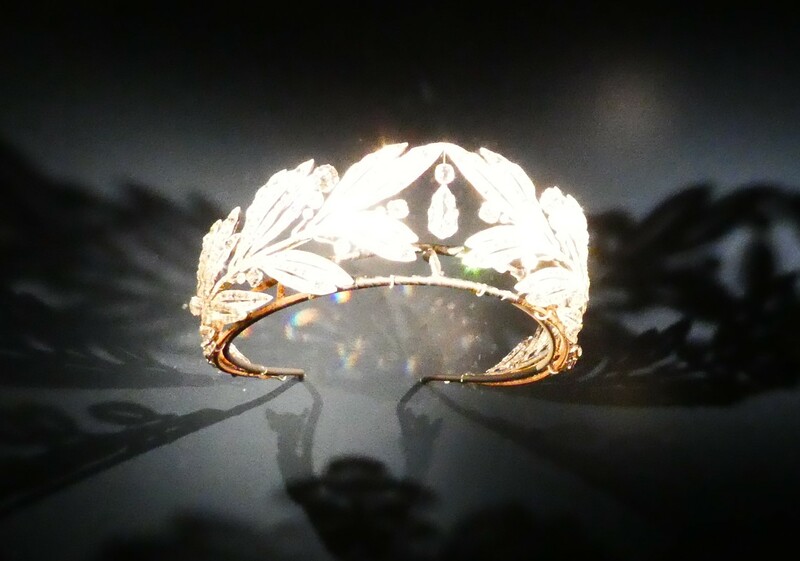 Laurel wreath tiara, ordered by Princess Marie Bonaparte for her wedding to Prince George of Greece. 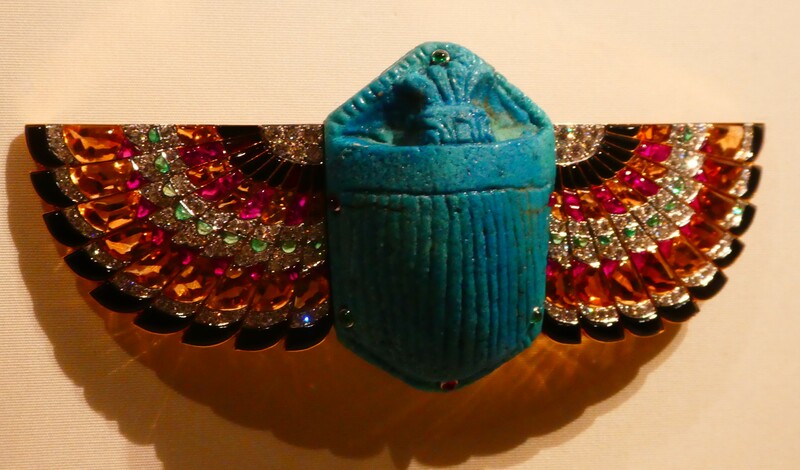 Scarab brooch from Egyptian collection. 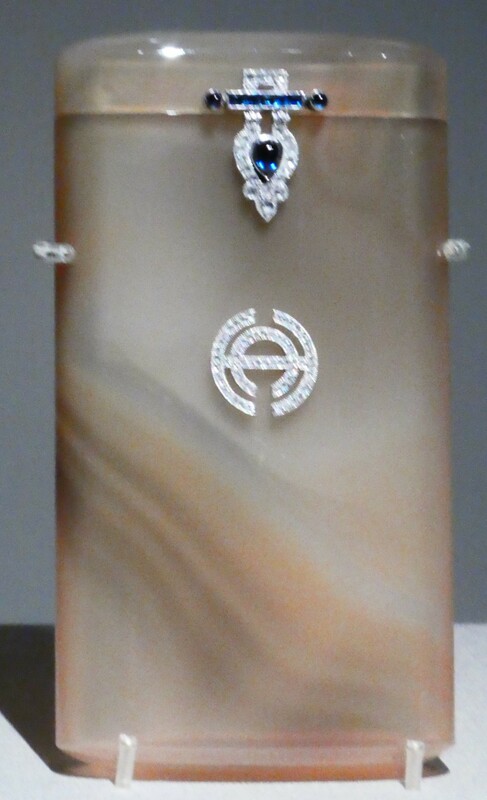 Gold, platinum, diamonds, ruby, citrine and onyx. 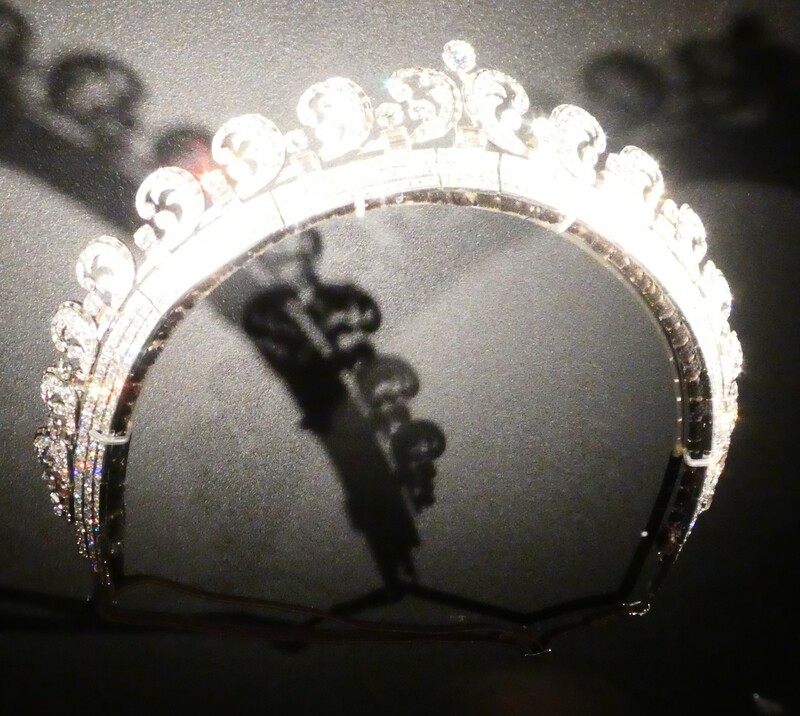 One of the reasons I took the trek up to Canberra was that the tiara Catherine wore for her marriage to Prince William was going to be there. And there it was. 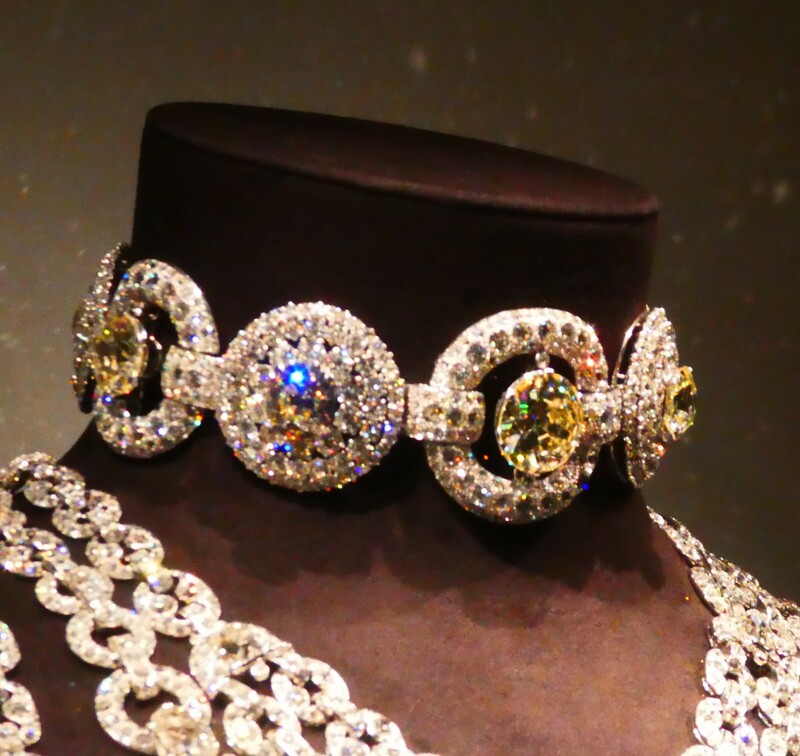 This diamond necklace was one of the gifts given to the Queen by the Nizam of Hyderabad, for her wedding to Prince Phillip. She took it with her on her 1954 tour of Australia and it’s the one featured in the William Darbie portrait that we grew up looking at. 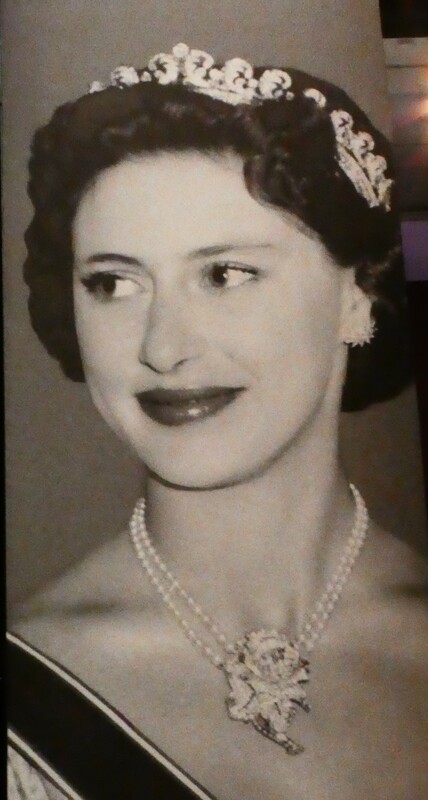 The Queen lent it for the exhibition. 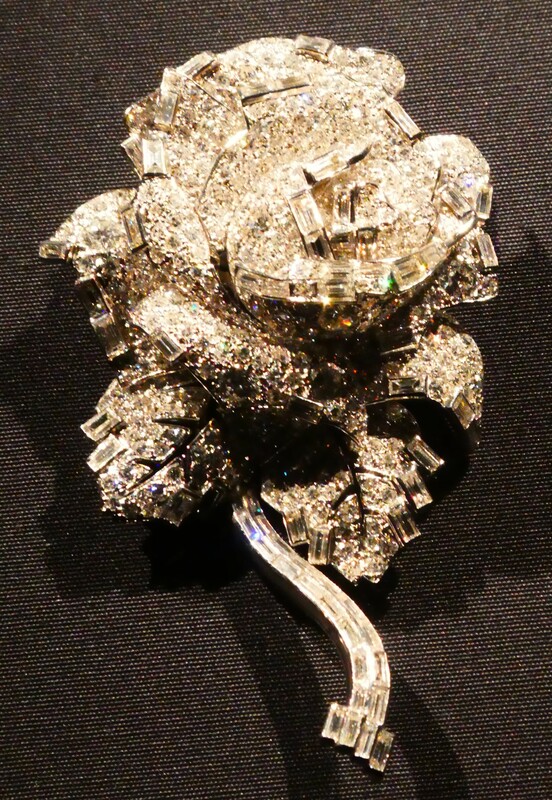 This brooch belonged to Princess Margaret, made in the perfect shape of a rose, with petals, leaves and stem of diamonds. I think that’s it attached to pearls in the previous photo. 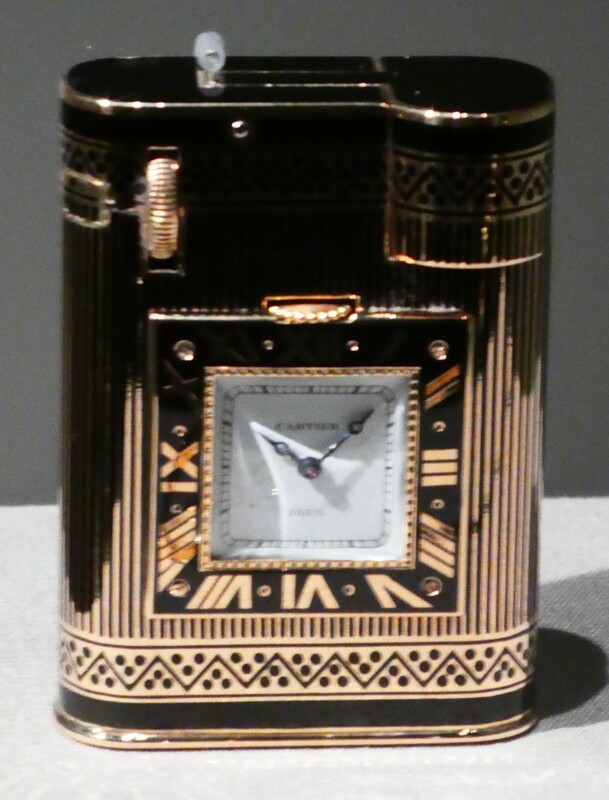 Smoking was considered an art form in the early 20th century, can you believe it, and wealthy people splashed out on its accessories. 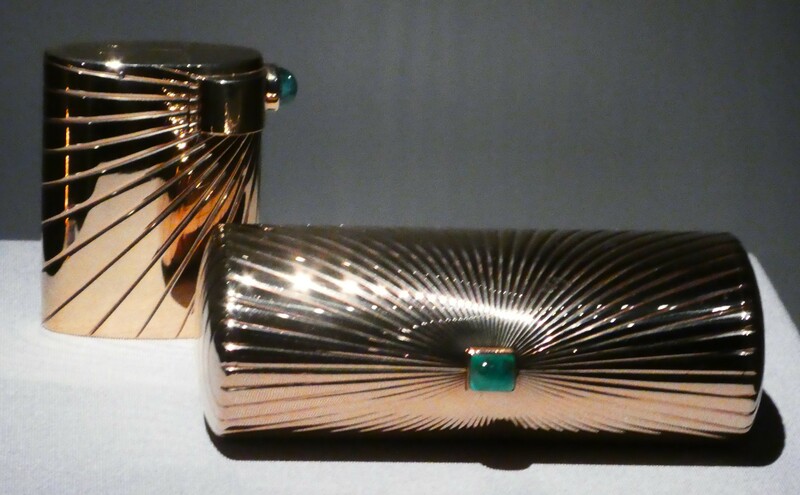 I could definitely have seen myself with this gold cigarette case and lighter in my early smoking days, slipped, needless to say, into my Cartier purse. 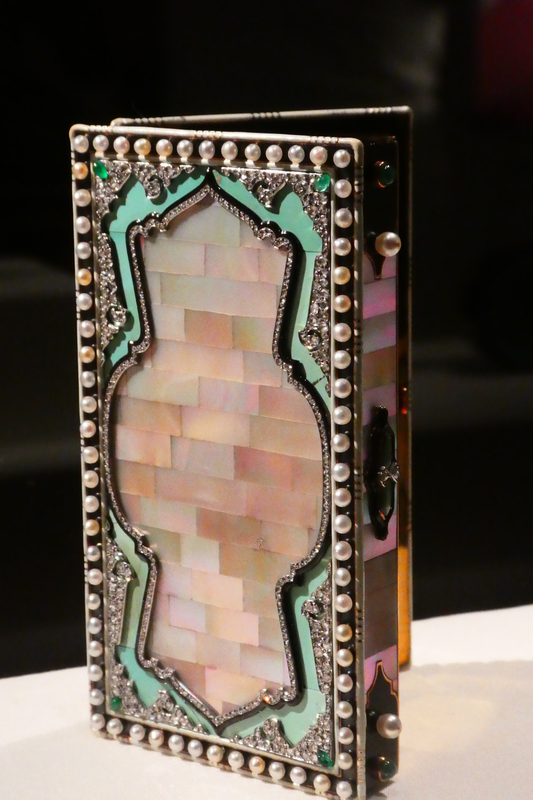 Love the emerald clip. 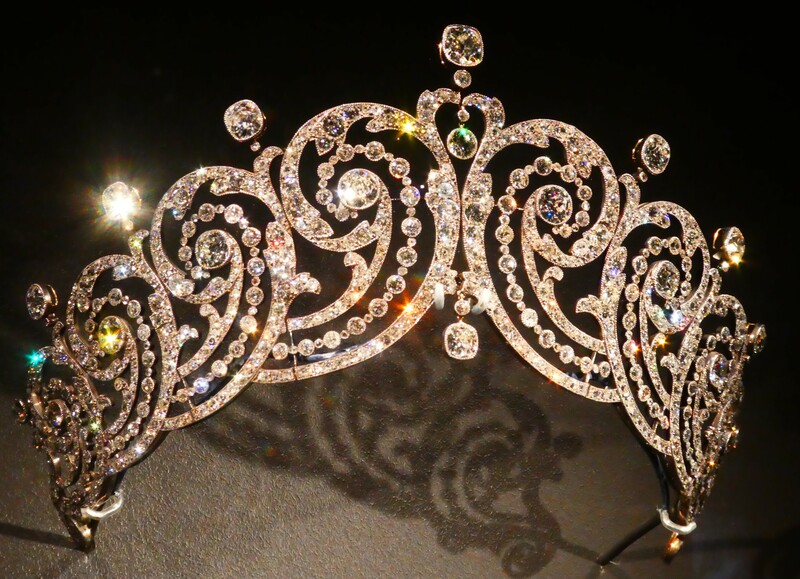 A few more tiaras. 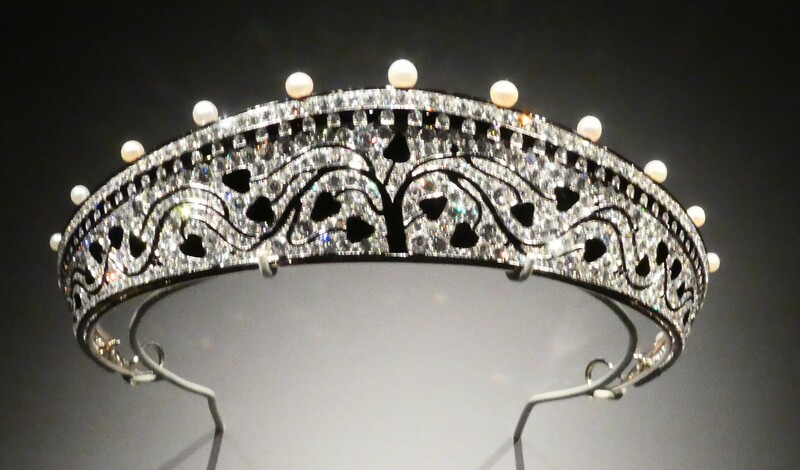 This one was borrowed by Prime Minister Winston Churchill’s wife for Queen Elizabeth’s coronation. A bit flowery for me. 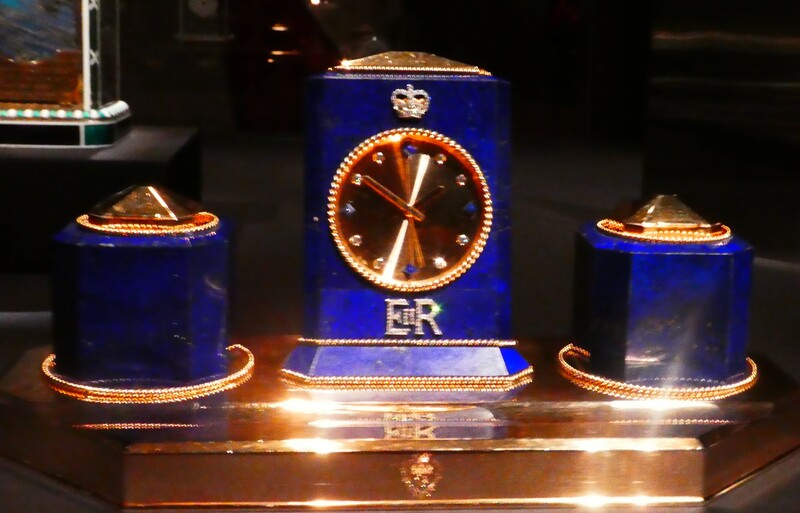 This Lapis Lazuli desk ink stand and clock were also lent by the Queen. 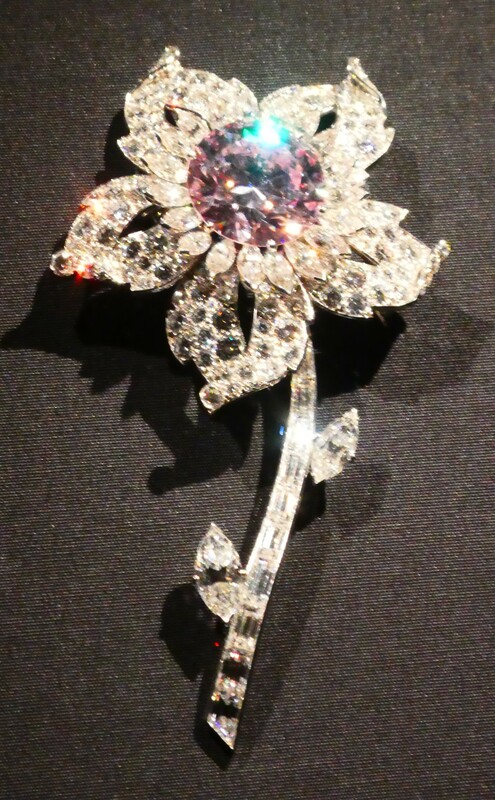 This bracelet-watch made of rubies and diamonds was so beautiful, so delicate, I considered smashing the glass and making a run for it. I don’t think I would have got far so I decided against it. The photo doesn’t do anything for it. 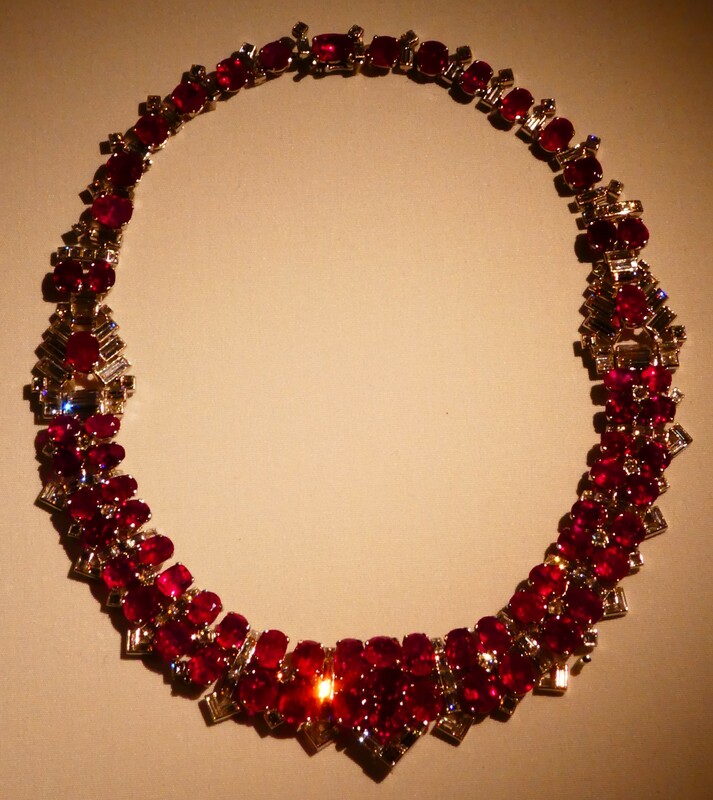 It was quite red and now I know I’ve got a thing for rubies. This necklace may be a little over the top but each to his own. 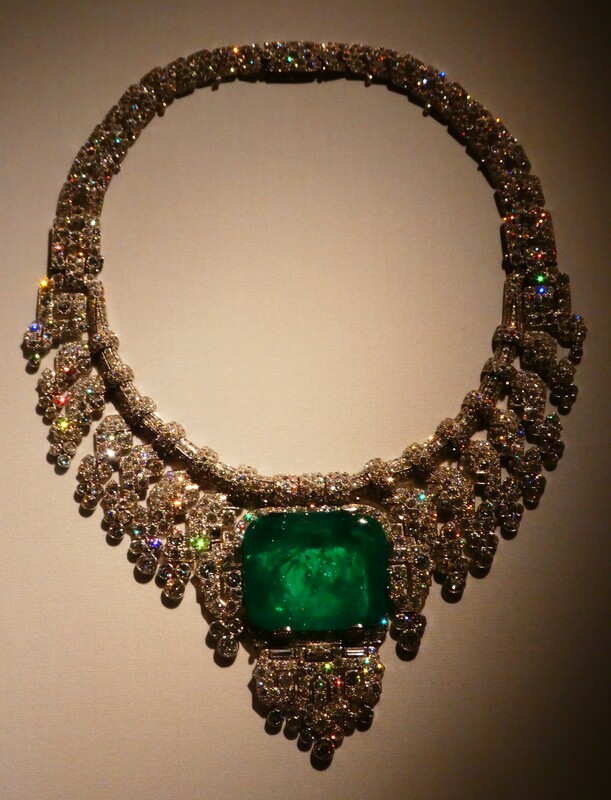 The emerald is 143.23 carats. These two necklaces are a bit different to the others on show. 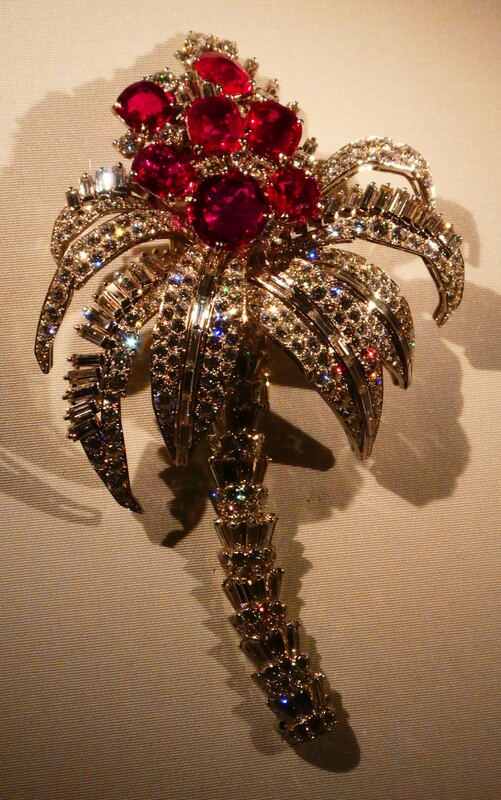 I definitely have a thing for Burmese rubies. 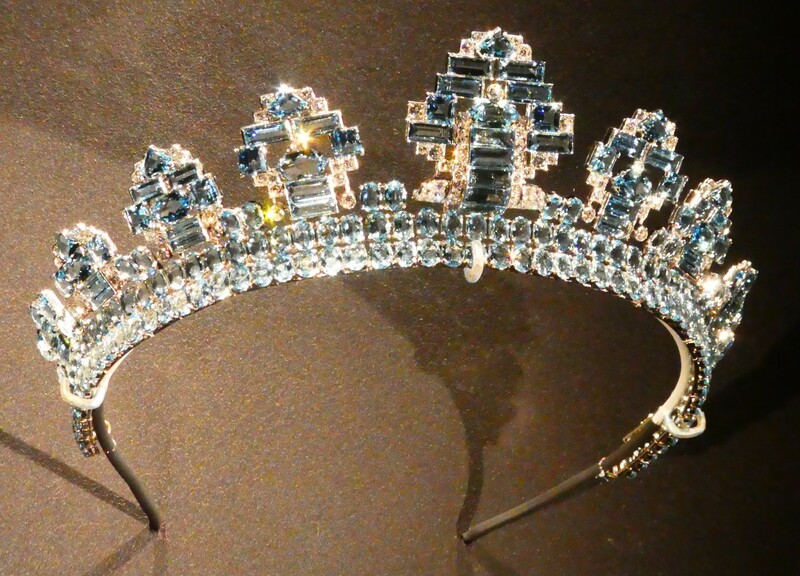 To finish off, I thought this tiara was lovely – a bit more understated than the rest. I loved the onyx pattern. 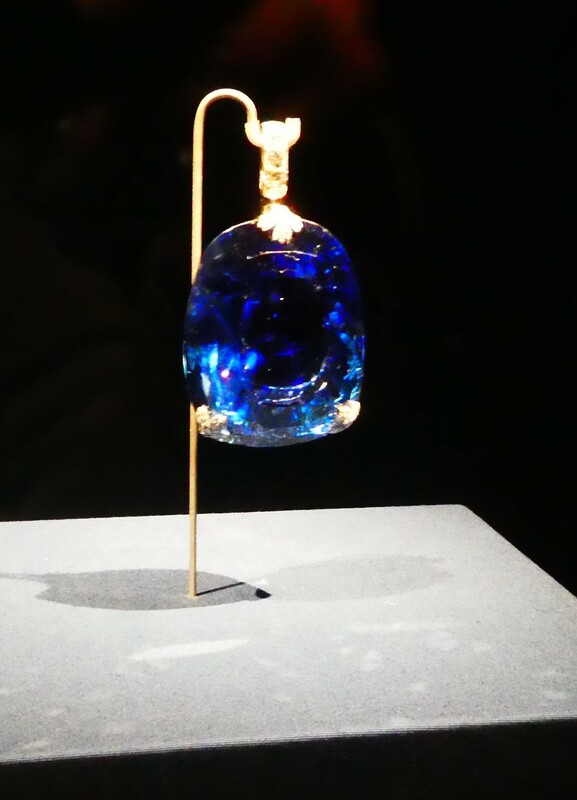 I think it belonged to Dame Nellie Melba, who had a considerable jewellery collection. The exhibition takes you through the various eras and changes in fashion and design over the 20th century and it’s fascinating. 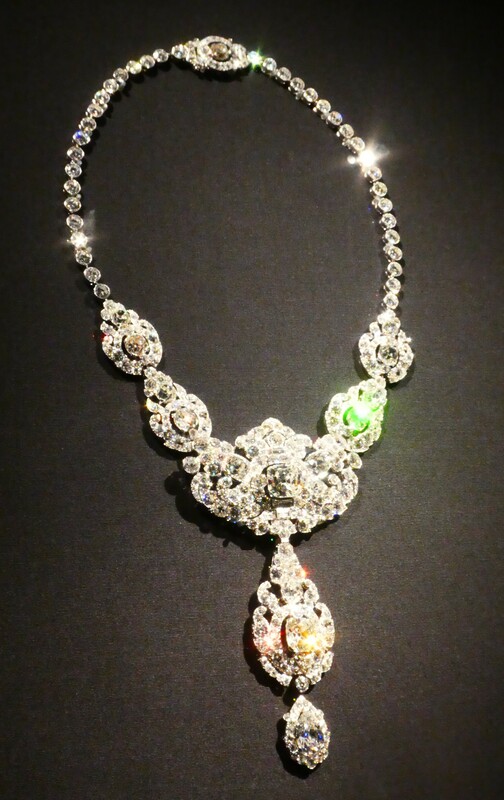 The older I get the more I enjoy (and covet ) sparkly and OTT jewellery. This exhibition fits the bill. Very nice. Thanks Suzanne. It’s certainly a picture of how the other half lives. The value of this stuff is too mind-boggling to even contemplate. What a stunning collection Coral, well worth the journey. 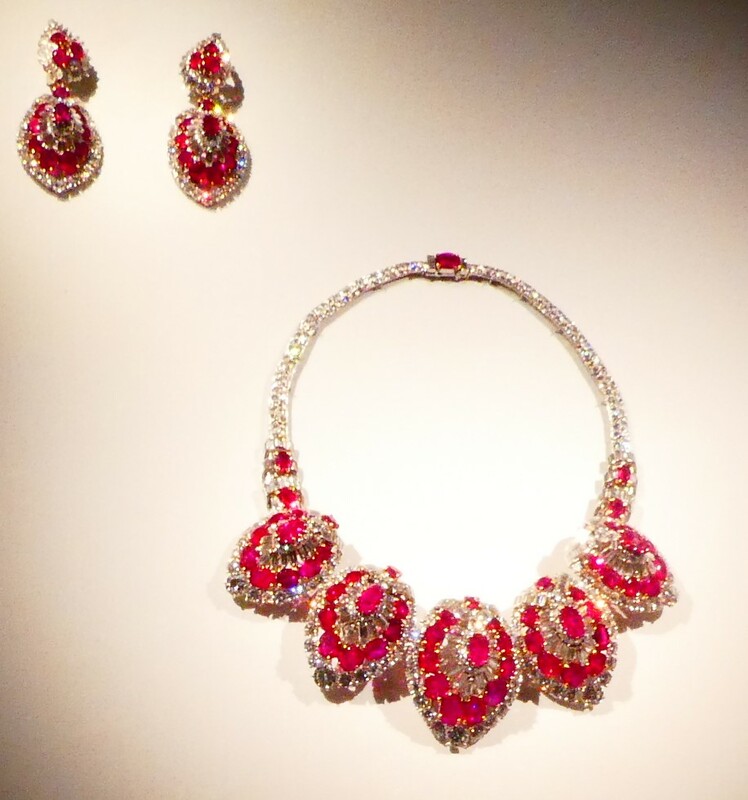 So luxurious and glamorous, Coral! 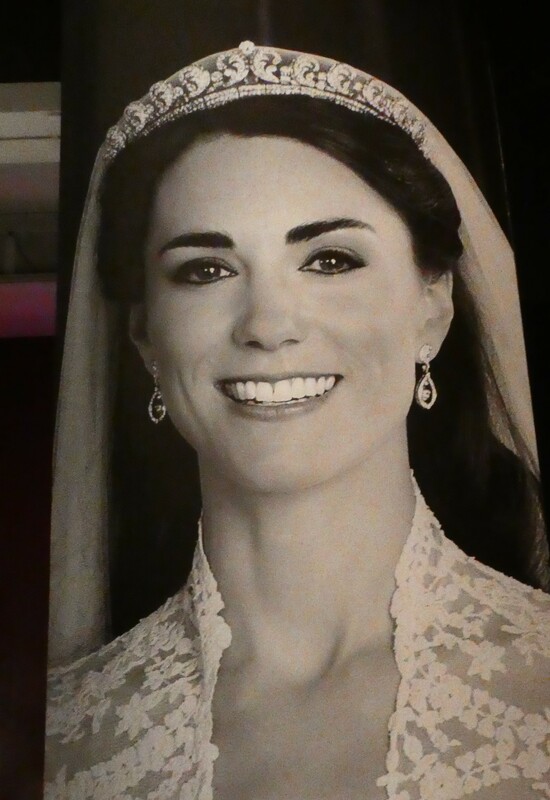 You must have had an awesome time there and those tiaras are breathtaking. 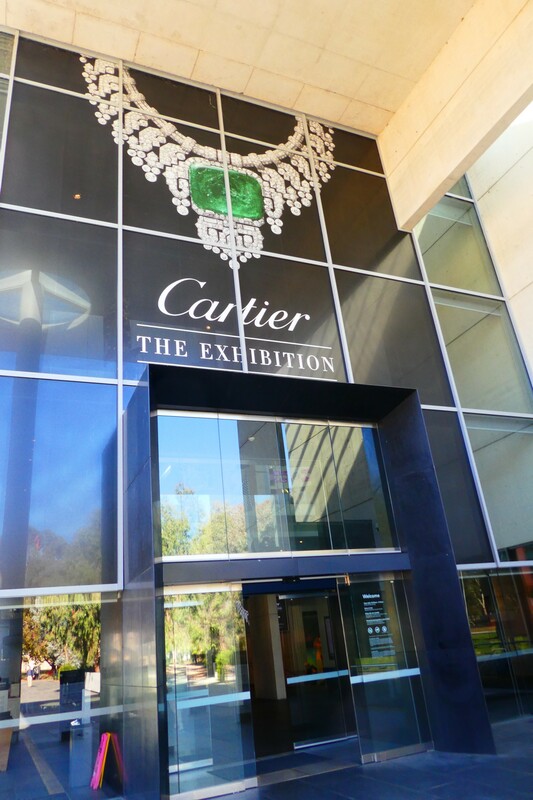 Thanks for sharing pictures from this exhibition and bringing it closer to us who couldn’t be there! No worries, Lydia. Thanks for visiting my blog. 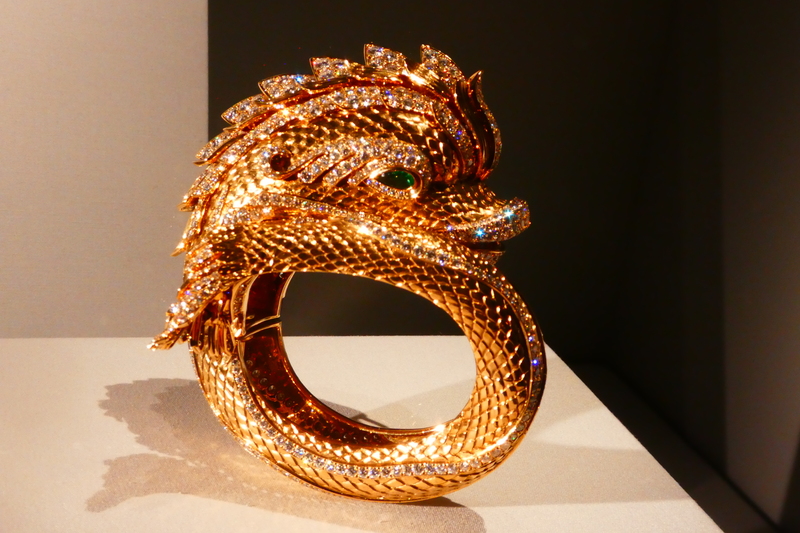 I was just in Paris and the window displays at Cartier’s were amazing so this would have been something to see. 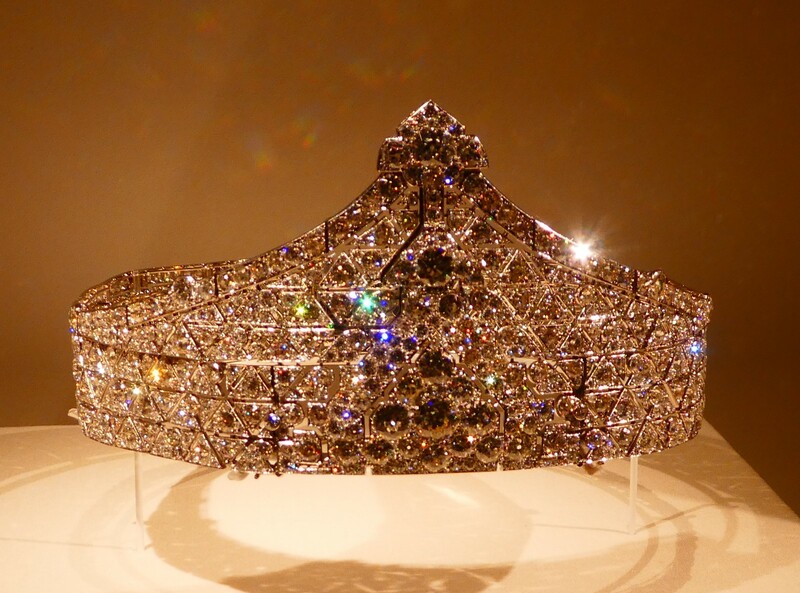 I like the last tiara best too. Unbelievable, Darlene I’m very jealous of you being Paris, by the way. Just a touch beyond my price range too, Rosemary. I’m happy just to look. Quite and imagine the insurance costs!! That’s a shame, kayrpea61. Thanks for visiting my blog.